MicroGrafting was designed and created by Guci Image for Men and Women who do not choose surgery as there Hair Loss solution. MicroGrafting is another in our list of exclusive State-Of-The-Art technologies for thinning hair. This “Strand by Strand” method was created for areas on the scalp that are extremely visible to the naked eye (hairline, temples, crown and part). This unique process attaches as little as 1 to 6 strands of hair to a “single strand” of your own hair. What makes this process so unique, is that Guci has perfected it using 100% human hair rather than “synthetic hair” that other companies tout. The attachment method is done without the use of any adhesives or heat and utilizes a barely visible “microscopic knot” at the root of your hair. Once the hair is attached, this undetectable technology looks, feels and behaves just like your own growing hair. Understanding MicroGrafting might be difficult until you actually see what it can do for you! You may want to think of it as the worlds smallest invisible hair extension. 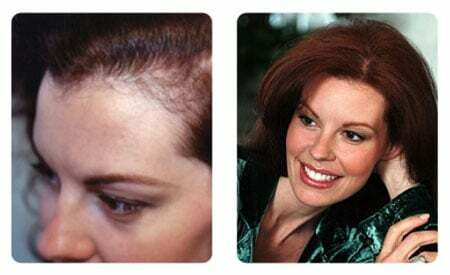 One of the many problems facing men and women today suffering from thinning hair, is when you have just a small area on the head that is very visible to the naked eye and in need of just a “little hair”. But Guci has answered that problem! Before MicroGraphing, many people would opt for those “synthetic hair fibers” you shake on your head or colored polish sticks to use as coverups. Guci Image world leader and innovator in Hair Loss technologies has changed all that. So if surgery is not an option, and you’re tired of using inferior coverups to hide your problem, than let MicroGrafting do for you what is it has done for so many others.